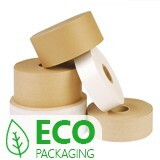 This popular, variable length manual tape dispenser dispenses tape up to 760mm long ready for carton sealing. 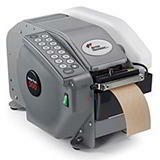 Simply load gummed paper tape up to 77mm wide and with one pull of the handle, this machine feeds out a pre-set length of paper tape. A simply manual setting determines the length of dispensed tape, and the guillotine blades cut the tape to the required length. This rugged tape dispenser is easy to use and can be used with standard or reinforced paper tape. It has a uniform wetting action and a large water reservoir, so you don't have to refill as often to achieve good water coverage of your tape. This variable length tape dispenser weighs a solid 10kg, which makes it sturdy but portable. If you're looking to buy a manual gummed paper tape dispenser, then you won't go far wrong with the world's best selling model!